Another Beautiful Day in Paradise. We had our first cold spell and it was in the mid to high 60s for the blade/bicycle. We had a NE breeze and clear blue skies. Bladers/Bicyclers Breeze, Roy H, Cindy B & Phil V, Dan C, Jim F, Nick S, Cindy S, Charles C, Steve G, Wendy H, Jeff B, Ginnie S & Rick P, Carol J, Wilma F and Bruce M came. Welcome all. Jeff led us off to the South end and then we headed N - NE into the breeze for the northern part of the trail. They had smoothed out many of the rough places in the trail which was very nice. As usual some turned around at the bridge and a few went to the North end and back. Those that did the full trail did a 15 mile round trip and those to the bridge and back did 10 miles. We had 5 bladers and 12 bicyclers. We Brunched at the Garden Grille as planned. We got right in and seated at two tables. The food service was a little slow getting started but the coffee flowed freely and the food was good as usual. We had many ratings of 9's to 10's. We'll give the Garden Grille a 9.5. 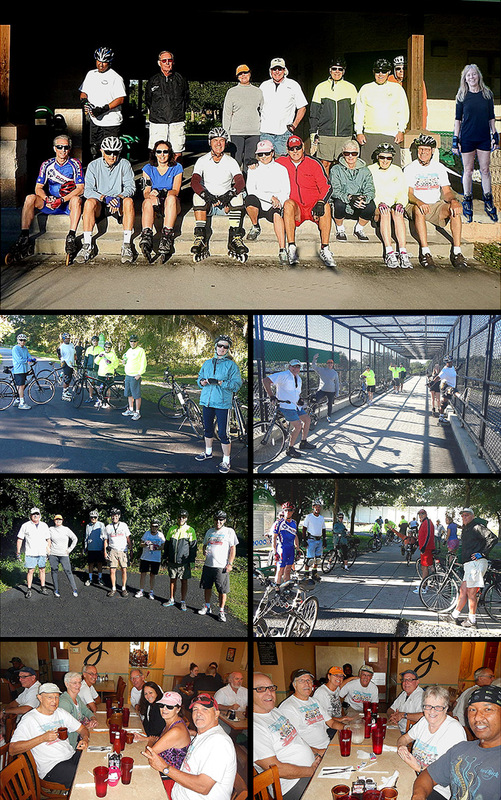 Those that did the full trail were getting a head start preparing for the Pinellas Trail Skate Nov 14-16. Besides the actual Trail Skate on Saturday the 15th, there is blading/bicycling on the 13th, 14th and the 16th. Also there are social events on the 14th, 15th and 16th. Check out the details/registration page!